The new 406 series SMT socket strip from Mill-Max is ideal for socketing leaded IC devices on SMT boards and for low profile board stacking applications. 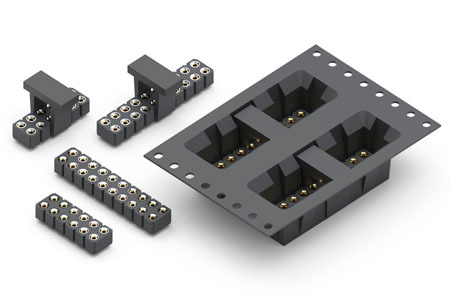 The connector is dual row, .100" (2,54 mm) pitch, accepts standard IC leads and when used in combination with SMT or through-hole headers, provides a reliable interconnect solution. It offers a low-profile height of 0.146" from the board surface and, when mated with a Mill-Max 429 Series SMT header, provides a board-to-board height of 0.300". Secure mating is established and maintained by four-finger contacts inside each precision-machined receptacle body. The pin base of 406 Series sockets is only 0.029" in diameter, allowing for a small PCB pad size and more space for routing traces. A co-planarity of 0.005" is achieved for up to 20 positions, and standard designs are available in 4- to 20-position configurations. These sockets are manufactured with high-temperature insulators and are compatible with all SMT soldering techniques, including RoHS-compliant environments. The connectors are packaged 335 pieces per 13" reel and fitted with a vacuum pick-up cap for enhanced accuracy and efficiency during pick-and-place assembly manufacturing.